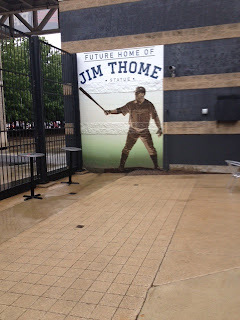 As many of you know, I am a huge Jim Thome fan. The other day, as my family was making our way back across the United States after our vacation in da 'Burgh, Thome knocked in an all-time leading 14th walk-off homer! To boot, Papelbon had put a $5000 bounty on a walk-off for the game as an incentive to get his teammates going. Thome answered the call! He now leads the majors in walk-off homers. Way to go, Mr. Thome! The photo comes from my trip to The Jake during a (thankfully) brief afternoon thundershower.